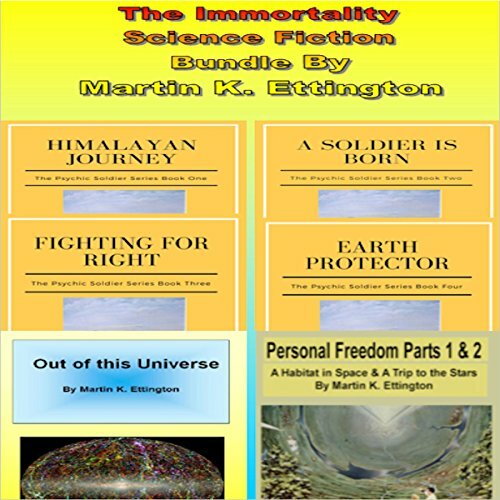 This bundle includes six science fiction audiobooks all with a common theme: immortality. The main character in each story lives an extraordinarily long life and has many adventures along the way. Being an international writer on longevity and spiritual or psychic abilities, I try to be realistic about the development process of longevity and these abilities. The Psychic Soldier series, books one through four - in this series, the hero Tristin Morgan is born in the early 19th century. He becomes a British soldier and develops his psychic abilities to fight various evils and even aliens as the series develops. The adventures go from learning in "The School of the Gods" in the Himalayas, to participating in major 20th-century wars, to meeting and fighting aliens. Personal Freedom books one and two - in part one, we learn the story of a young man who lost hope - then found it again. This led him to a career in space manufacturing which evolved into a project building habitats in space. There have been a lot of discussions about space habitats, but how would you actually build one, and what technical and personal issues would arise in the process? Part two is about converting the habitats to an interstellar spaceship to settle a new planet. It is a long journey with major dangers along the way, a generational ship with long-lived residents. What new abilities would people develop on a long journey to the stars? Follow this adventure to learn the realistic challenges of an interstellar journey. Out of This Universe is a science fiction collection combining many elements of immortality, psychic powers, and the fate of the universe in a wonderful story spanning many ages of time. The story follows the life of Steven and his friends as he proceeds through innumerable ages of existence, fighting forces which not even the Gods totally understand. Second rate stories and production. It felt like I was listening to a self published high school assignment, with the writer and narrator (same person) struggling to produce a school project. The narrator taking every opportunity to read his name aloud. The narrator often paused as if looking for his spot in the story. The stories were read in the first person but it felt like it was a young man telling telling his school mates. His voice was quite pleasant though. Also many very poor uses of the language e.g. ' decending down the hill' . It is presented as a collection of different stories while in fact they were simply one persons essays. I have very rarely failed to finish a book or return for refund. I did both in this case. Having said this I was only able to make it a quarter the way through. Perhaps the later stories improved.